Check out these slot games made by Yggdrasil. 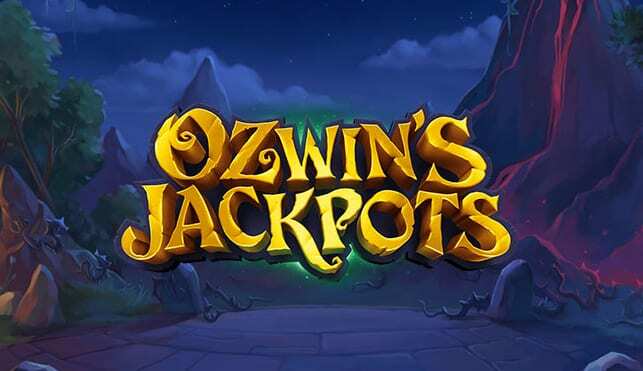 Ozwin’s Jackpots is one of Yggdrasil’s more recent productions. A progressive Jackpot video slot which boasts a sorcerer theme which drags you into the gloomy mist of the night within the harrowing trees of an unknown forest. The minimum stake for this game is only 20p, with the maximum at £40, accommodating the standard gamers not just the high rollers amongst you. This game is available on all platforms such as mobile and tablet devices as well as desktop. 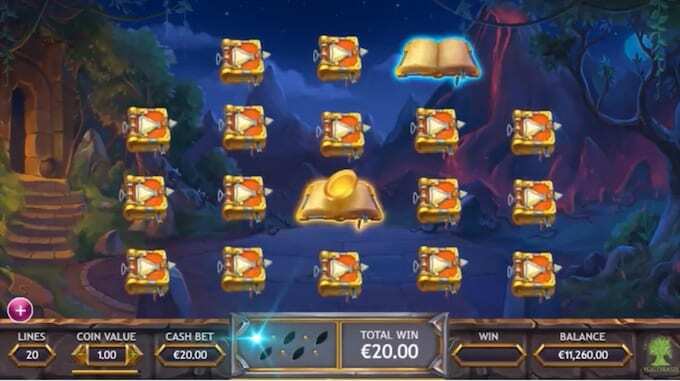 Yggdrasil are young developers in comparison to most of the other game providers out there, however, Yggdrasil finds themselves already in the top category of online gaming developers after making a sensational impact on the slots market. With the launch of games like Orient Express and Vikings Go Wild they have made their mark and are now becoming one of the most respected developers in the world. Ozwin’s Jackpots emphasizes what Yggdrasil are all about, the regular production of fresh content that instantly rivals the hottest slots on the market out their right now. Fancy playing a different game by Yggdrasil? Discover slot games online today! As you dive into the mystical hollows as you’re accompanied by some Disney-like audio while you gaze across the reels at the shining symbols represented by owls, compasses, bottles, cards and of course the Ozwin himself. Make sure you have your Owl eyes on to look out for the Owl symbol itself as this will provide you with the biggest payout, paying the maximum of 200x your stake. If you’re one of those players who like the mega progressive Jackpots, then you needn’t look any further. Read our guide for top-rated slot games online from different categories today. So, if you are going to aim for the big win, you’re most likely going to have to set a budget of £1,000 to take home this baby! Leaving it all up to you to grab the opportunity of free spins with both hands, or the spell book bonus round which can be accessible in the base game. Spellbook Bonus Feature: This is activated when 3+ of the spellbook symbols land in the base game. For instance, if you acquired 4/5 of these the cash prize will be anywhere between 50 to 500x what your stake was. When this feature has been triggered and in full flow, you will be taken to a new screen where you will be presented with 18 spellbooks for you to open, each revealing a prize. You must try and avoid revealing the evil spell which is in one of the books as this will end the round. Jackpot Free Spins Feature: This feature can be started in two different ways, either by finding 5 crystals that are the same or you can activate this round by landing 3+ scatter free spins symbols which can appear anywhere on the reels. If you’re lucky enough to encounter 3+ free spin symbols, you’ll be awarded 10 free spins with 3x multipliers. If you manage to go that step further and locate 4/5 of these, you can expect a payout prize of 50-500x your stake. If the free spins were generated through collecting 5 crystals, these will be transformed into your first orb which will automatically supply you with 10 more free spins and tripled wins. 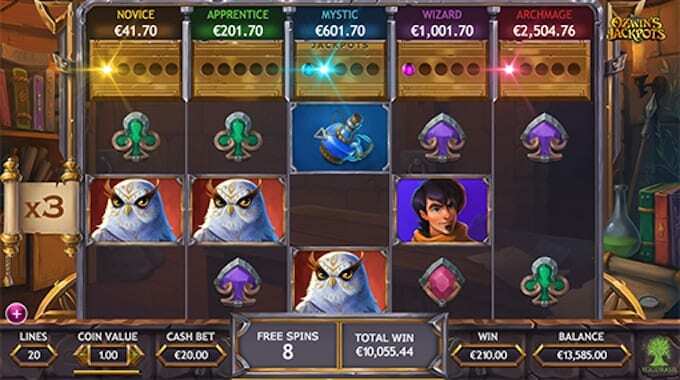 As this is a Jackpot game, the five jackpots that are up for the taking come in the form of magical and mystery colours: Archmage, Mystic, Wizard, Apprentice and the Novice. This may come across as one of the more complicated games, but we can guarantee you once you’ve got it sussed you will never be able to stop playing, the wide range of features that this game offers are what makes it so special. 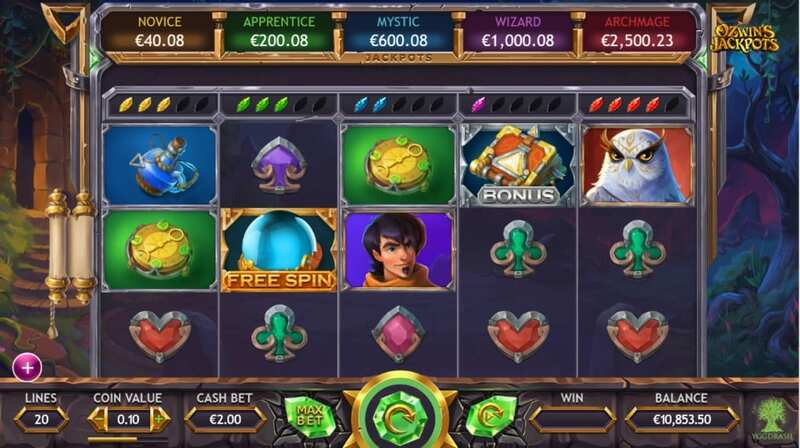 The mystical theme drags you into an adventure that you’ll remember forever as you smash those generous Yggdrasil Jackpots, we salute you Yggdrasil! If you enjoyed playing Ozwin's Jackpots then you'll love Deco Diamonds.